Namira is a modern and colorful PowerPoint presentation template filled with vibrant colors, beautiful shapes, and modern designs. The template comes with more than 50 unique slide designs with image placeholders, vector icons, graphics, and much more. Valleza is another elegant PowerPoint template that features a colorful design. It includes a total of 150 slides and 5 pre-made color schemes. Each color scheme template includes 30 unique slides and allows you to customize it however you want. Watch is a minimalist PowerPoint template featuring a modern and elegant design that stands out from the crowd. The template has 30 unique slides with customizable drag and drop designs, image placeholders, vector graphics, and much more. This PowerPoint template comes with a set of modern and professional slides that include highly visual designs. The slides in this template let you highlight your brand, business, and products with large images as well. It includes 30 unique slides in 5 color schemes. Belrust is a creative PowerPoint template that’s most suitable for making presentations for startups, agencies, and marketing brands. The template comes with a total of 150 slides that features lots of editable graphics, vector icons, and infographics. This PowerPoint template is specifically designed for making presentations for technology events and pitching startups. It features plenty of useful slide designs that can be easily customized to your preference by changing colors, text, and images. Red Line is a modern PowerPoint template featuring a stylishly minimal design. The template includes 20 master slides that come in 2 different sizes to fit all types of screens. It also features image placeholders, icons, graphics, and much more. Tactic is a creative and visual PowerPoint template you can use to create presentations for modern businesses, startups, and design agencies. It includes 30 unique slides filled with editable graphics, image placeholders, and free fonts. Baggio is a colorful and stylish PowerPoint template that features a total of 150 slides with gallery and portfolio slides, vector graphics, icons, and more. The slides in the template are also available in 5 different color schemes. Dorma is a modern PowerPoint presentation template featuring a minimal and elegant design. This template is most suitable for making branding and marketing presentations. It includes 30 unique slides you can easily customize to your preference. Mayago is a fully animated PowerPoint template you can use to create all kinds of slideshows for creative and professional presentations. It includes 30 unique slides filled with resizable vector graphics, icons, infographics, and much more. The template is also available in 5 different color schemes. Nuguya is a PowerPoint template that comes with a feminine style slides design featuring lots of bright colors and layouts. This template is perfect for promoting and creating slideshows for creative and business presentations. The template includes a total of 360 slides in 12 premade colors. Insine PowerPoint template features a modern and an elegant design with lots of colorful slides. The template comes with 50 unique slides with lots of infographics, icons, and vector graphics. 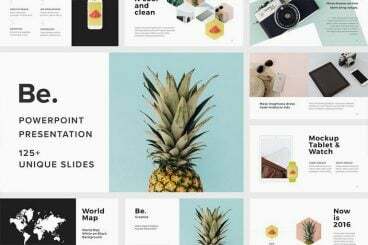 Orlan is a minimal PowerPoint template that’s most suitable for creating slideshows for creative and marketing related presentations. It includes 38 unique slides featuring free fonts and transition animations. This modern and creative PowerPoint template comes in 3 different color themes, including light and dark color designs. It includes a total of 360 slides that are available in 12 different color schemes. Yellow PowerPoint template comes with a modern design featuring 36 unique slides filled with lots of shapes, vectors, icons, and graphics, The template includes image placeholders for easy editing and free fonts. Xanthopsia is a creative PowerPoint template that comes with 50 unique slides that are designed to give more focus to images. This makes it the perfect choice for creating presentations related to photography and fashion. Travient is a modern PowerPoint template made for promoting hotels and travel agencies. It includes 80 unique slides that are available in 10 color schemes and 134 master slide layouts. Morphology is an effective PowerPoint template you can use to create slideshows for modern business and startup presentations. The template comes with 30 unique slides in 5 different color schemes, making a total of 150 slides. Theo is a colorful PowerPoint template that features lots of attractive illustrations, infographics, and charts for creating more engaging presentations for businesses, startups, and corporations. It includes 30 unique slides in 5 premade color schemes.